The train SDF is pretty cool! The rest isn't really, especially the 4klang instruments. Not bad. I don't think this is raymarched. 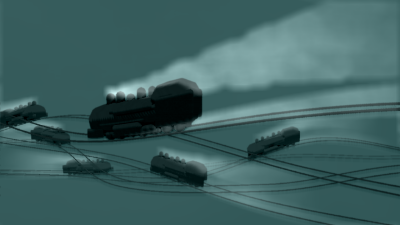 It looks like the trains (and maybe the smoke shapes too, before blurring) are made of polyogonized spheres. Nice! I like the overall theme of the into. These are polygons, right? Or? Not super, but different at the very least. I wish it had more of any kind of progression. not bad. still not quite there but not bad.